NEW YORK, Sept. 25 (Yonhap) — North Korea’s foreign minister arrived in New York Tuesday to attend the United Nations General Assembly and possibly lay the groundwork for a second summit between U.S. President Donald Trump and North Korean leader Kim Jong-un. Ri Yong-ho arrived at John F. Kennedy International Airport on a plane from Beijing. A convoy escorted him out from the runway under tight security and outside of journalists’ view. The minister is scheduled to address the U.N. General Assembly on Saturday. His visit also comes as the U.S. and North Korea are working on a second meeting between Trump and Kim to move forward the process of dismantling the North’s nuclear weapons program. U.S. Secretary of State Mike Pompeo said earlier that he has invited Ri to meet with him in New York this week. 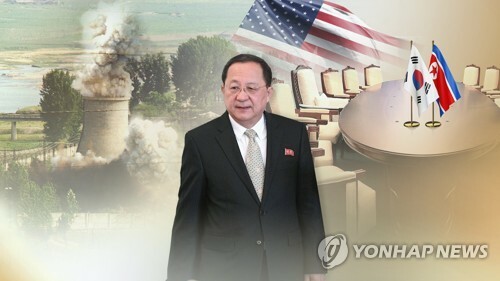 At the first summit in Singapore in June, Kim committed to work toward “complete denuclearization” of the Korean Peninsula in exchange for security guarantees from the U.S. Implementation of the deal has stalled as the U.S. demands a full declaration of the North’s nuclear arsenal and the North insists on a joint declaration of an end to the 1950-53 Korean War, which ended only with an armistice. A new opening for talks was created last week after South Korean President Moon Jae-in held his third meeting with Kim and secured a commitment from the North Korean leader to shut down a missile testing site and, conditional on corresponding measures from the U.S., key nuclear facilities. He also thanked Kim for his “courage” and the steps taken so far to honor their Singapore agreement. This year’s U.N. gathering takes place against the backdrop of significantly lowered tensions compared to a year ago, when Trump stood at the same podium to threaten to “totally destroy” North Korea over its nuclear and ballistic missile programs. He also interpreted Kim’s threat to take unprecedentedly strong measures as possibly meaning the detonation of a hydrogen bomb over the Pacific Ocean.